T-Mobile announced big news for current Simple Choice customers on the $50 plan, throwing in 100% more 4G LTE data at no extra cost, bringing the total amount of data to 1GB. To access the new amount of LTE data, customers don’t have to do anything, as the change takes place automatically on your data plan. 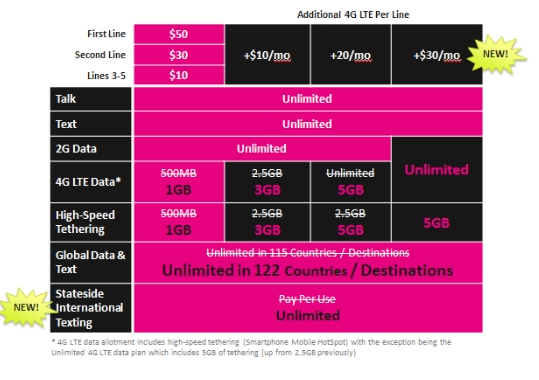 Customers on T-Mo can still add second lines for $30 a month, with up to three additional lines for $10 a month. Another new change is how much data you get if you opt to buy additional data for your plan. Previously, when purchasing data, you would be charged $10 a month for 2.5GB. After these changes, you will get 3GB of data for the same price. To sum it up in very simple terms, T-Mobile is giving you more data for the price you were already paying. Pretty nice of them, yeah? Simple Choice customers still start with one line at $50 per month for unlimited data, talk and text on our nationwide network – but will now get a full 1GB of 4G LTE data and tethering – double the previous amounts. Customers can still add a second line for $30 per month and up to three additional lines for $10 per month. Those additional lines also get the extra 4G LTE data with these changes. As before, Simple Choice customers can always add more 4G LTE data to each of their lines. They can opt for 3GB of 4G LTE data, including tethering, for an additional $10 a month per line (vs. 2.5 GB previously), or 5GB for an extra $20 a month per line. There is a new unlimited 4G LTE option, which now comes with a full 5 GB of tethering, double the previous amount, for an extra $30 per month (vs. an extra $20 previously). In addition to more data, T-Mobile is also expanding their service of unlimited data and texting while traveling to new areas. The total of markets supported by this feature has now hit 122 countries/destinations, which is pretty impressive compared to how traveling with your smartphone used to be. T-Mobile is adding seven additional countries and destinations where postpaid Simple Choice customers enjoy unlimited data and texting while traveling – and low, flat-rate calls for just 20 cents a minute, bringing the total to 122 countries and destinations. New benefits for credit and postpaid accounts will begin on March 23, with pre-paid accounts getting access on April 26. For any additional info, hit up the via to see T-Mobile’s full press release.